Hey, do you have a site showing the machines you build? Would love to see some of them. Do you have any wiring guides for a normally open EOS? The pictures you have here are for the normally closed version, but the links you provide are for flippers with normally open EOS. There is probably a way to wire it Normally Open, but I’d have to think about it more. 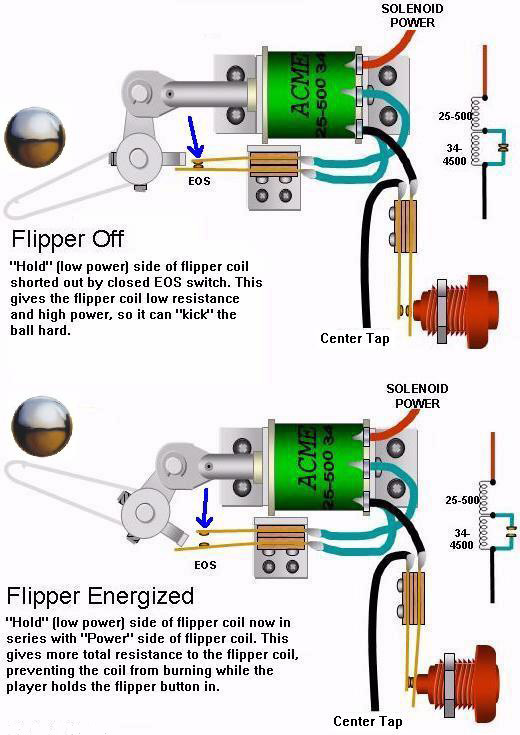 A majority of the “NO” configurations are for Fliptronic machines, where the switch closure is used to signal the controller to start pulsing the flipper coil. If you are going to use the EOS switch to activate a hold coil, you should probably configure it as “NC”, which is the standard. If I came across one that was “NO”, I would just flip it around (assuming it was the high-voltage type), or put in a different switch. The photos are definitely “NC”, but yeah, you want to make sure you’re not buying a Fliptronic-type. love your posts very helpful ! 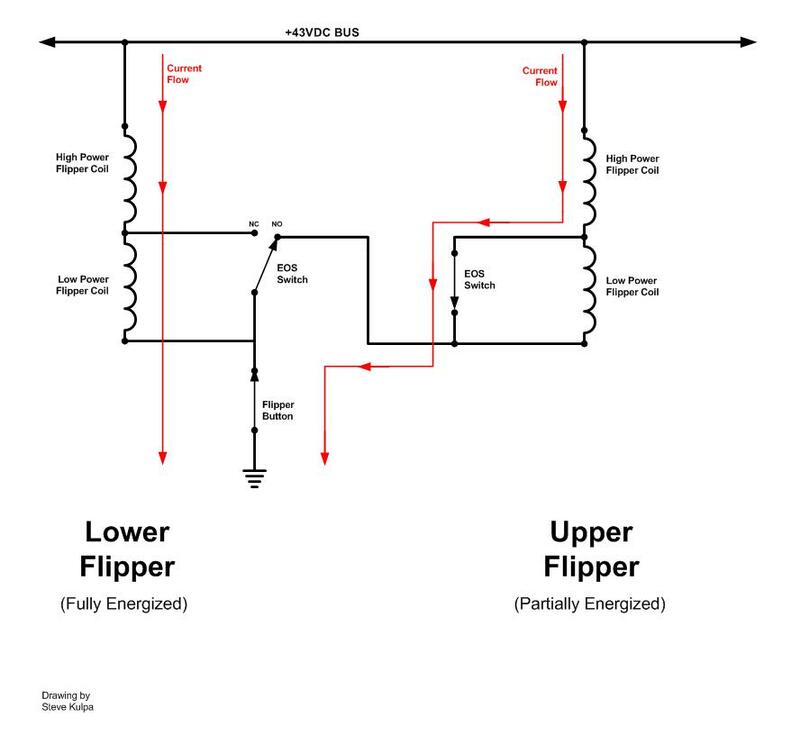 About the modern way to control flipper (with arduino & Poser Driver 16), how do you manage the voltage? I mean we should send a 36V very quickly to Fire the solenoid and then send a lower voltage to maintain the position. Where do you manage that? In the arduino code? Hi Salim, thanks for your post! I’ve discussed this with some other people, you might be able to find those posts as well, but my main recommendation when using an Arduino is to pair it with a flipper mech with a built-in hold coil and EOS switch. These are relatively easy to find, both new and used. And, they are fail safe if something goes wrong with your code, or if the Arduino loop time isn’t fast enough. I ordered and already received two single coil flippers… I thought I can manage the power with the code with some pulses to generate a 12V (for example) voltage to hold the coil. 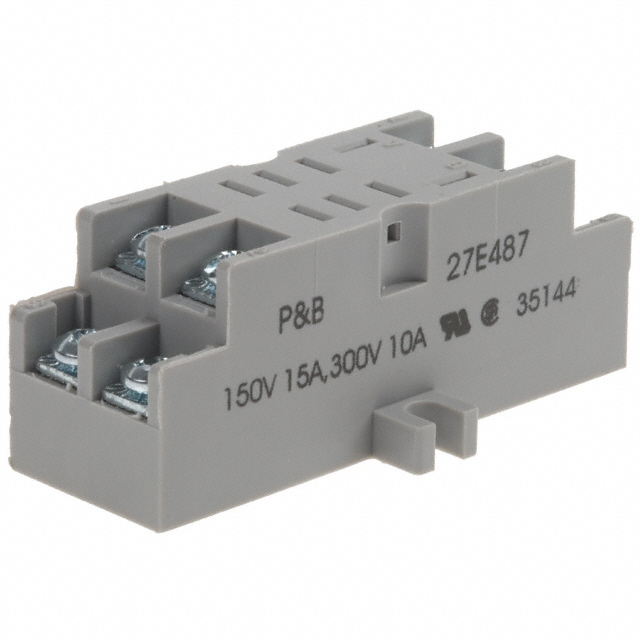 I also ordered the power driver 16… Can this controller generate pulses of 36V with a fast frequency? 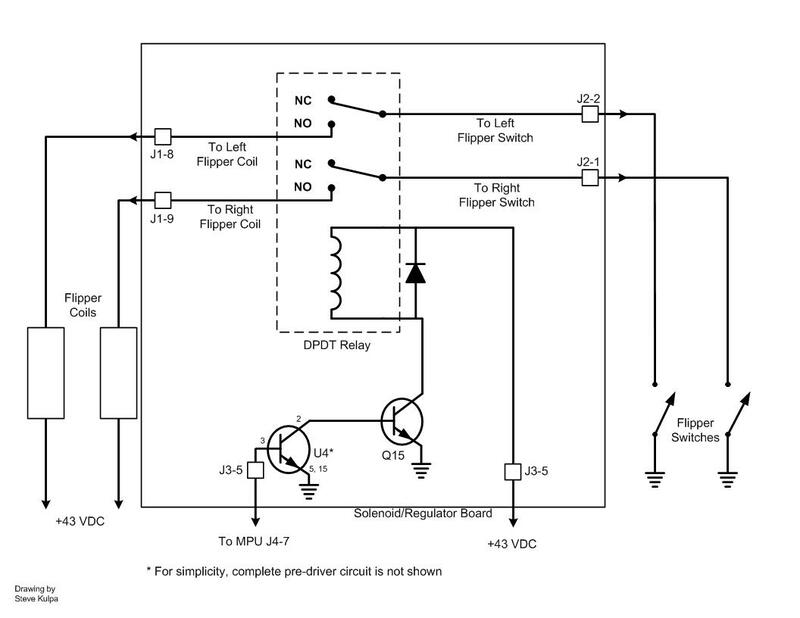 What people do in this case is when the flipper button is pushed, they turn the coil on full power for some short amount of time. Then, to lower the power, you would turn the coil on for a short amount of time, and then off for a short time, very rapidly (like 1ms on, 5ms off). 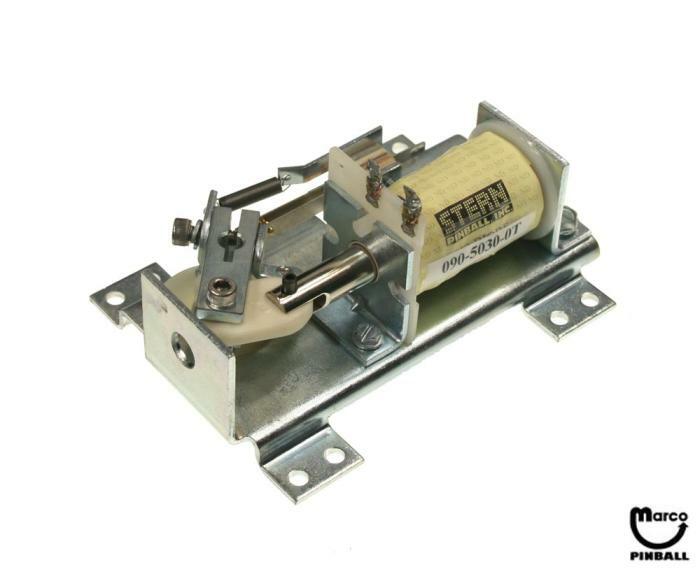 The coil acts like a large inductor, so it will resist changes in current, and thus limit the amount of current being supplied if the switching frequency is fast enough. Unfortunately you’re not going to know if you should have an on-time of 0.1ms, or 1ms or 10ms until you actually try it. I think this is the reason most people who go this route complain that their power supply keeps shutting down from over-current. I honestly think you will get much better results if you spend and additional $50 a piece on some dual-winding flippers with EOS switches. Alright then. I m gonna right the algorithm and mesure the output voltage generated before pluging the coil. If I generate a 12V, knowing the coil resistance is 5.5Ohm, it will consume average 2A which is ok for my power supply (LS-100 @ 36V, 3.5A). And worse case I will replace the coil from a simple to a double one. I ll keep you in touch I will pick up the PD-16 today ! Good luck, it’s certainly worth a try, and other people are doing that successfully (albeit with more processor power). One thing to be aware of, the solenoid coil is like a big inductor, and the V=IR equation is only valid during steady state conditions. Meaning, your max current could still be 36V / 5ohms = ~7A, even if your “average” voltage is only 12V. You need to have the on-off times very short, which means having a very fast program loop. Hi buddy, at first I want to congratulate your work and dedication to explain the critical points. I just can think about doing my own pinball thanks to people like you. Im really a noob, and a little more experienced only in the digital parts. So, my first trouble is to decide the flippers and power source. Ive started my project because a very dirty playfield in Brazil can cost like 1K us$, and the sega machines like 3k. EMs costs twice and SS up to 4x. So its important to decide the power suplly and coils system, so I can activate flippers, bumpers and start playing, even while developing the other components. Can You help me with some sugestions? Can be only a voltage and your coils, can be only the flipper system, can be only the coils, I need something to start. Im thinking about maybe a fully digital system, with 16v 2a coils, but its enough only for a tabletop right? EM or solid state based will need more power, so, which one to choose? Im trying really hard, but im feeling in trouble. So I keep studying arduino and electronics and pinball schemes, but I really apreciate your help. Looks like most people are sticking to the 36v to 48v range for coils, and I would definitely stay away from the 70v stuff (high voltage is dangerous, especially in a custom game). I’m back to working on my custom pinball ‘Blaster’ and wrapping my head around wiring up the flippers. I have an arduino > master > driver board with dual-wound flippers. From what I understand, I can wire the cabinet flipper button to the arduino and send commands to the driver board(pd 16) to fire the flipper solenoids. Do you already have some Arduino code that does this? I basically want to declare the switch input and then have it send it to the driver board to fire the first solenoid. Does that make sense? Anyhow, I’d appreciate the help! I have Arduino code posted here ( http://www.space-eight.com/Downloads.html ) near the bottom of the page. One of those projects is specific to scanning a switch matrix, and all of the game files include some form of switch reading. There is also a solenoid test code that sends out commands to the PD-16, and again same is in the game code. Looks like I’m a little late to the party, but I came across your site while doing some preliminary research on how to go about building a pinball machine. It’s something I’ve been wanting to do for a while, but I’ve never been sure if I had the time or money to build one. You’ve obviously had some experience with this- How much would a basic machine cost me just in raw materials and parts, and how long can I expect it to take to build? Here are two things to check out first that also have good online support: FAST Pinball (for hardware) and the Mission Pinball Framework (software). Each have user forums that are really active. As for time, it usually take me about two years to complete a game, but I also usually have two games in progress at the same time. I know other people are taking even longer than that (or could be shorter), so depends how much effort you put into it. I usually carve out at least a half-hour every day, and dedicate a weekend each month. Thanks, this helps put the whole project in perspective. I was hoping it’d be chaper than buying, but the fun’s in the designing and building anyway. I’ll keep you updated (read: ask lots of questions) if I decide to go for it. Thanks for the info, good luck with your own tables! There is another configuration that I can think off that would merge old and modern techniques. 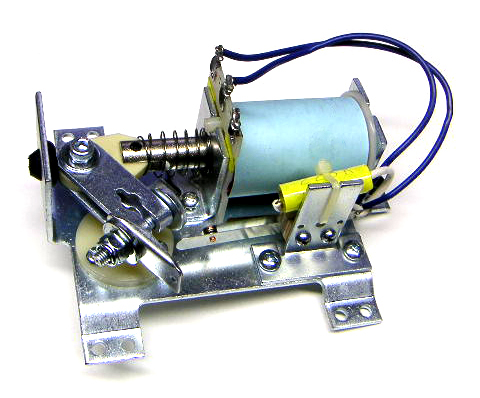 You could use direct firing method with an always on pwm signal on the solenoid. 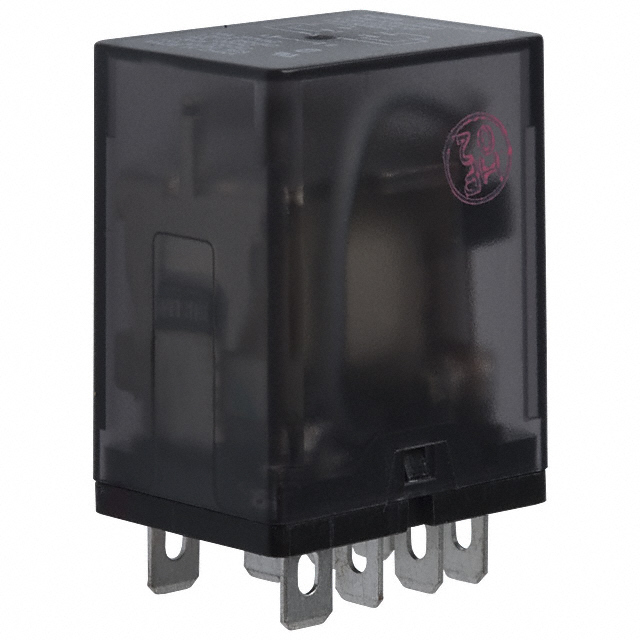 this way you have zero delay firing and regulated voltage on the solenoid. The default duty is the ‘firing duty’ while the ‘holding duty’ can be set when the EOS switch triggers/firing time has elapsed.